Here’s a little “eye candy” and design ideas for the container garden enthusiast! Create a vignette using inexpensive “Coca Cola” glasses from the dollar store, filled with gravel, sand and succulent cuttings. The mosaic bottle unifies the look. A repurposed muffin pan filled with moss makes a creative container display for succulent cuttings. Orange tumbled glass adds color to my bromeliad while I wait for it to bloom! Metal Figure Model + Common Annuals= Uncommon Combo! “Simply Sorbet!” Don’t be afraid to add containers within containers. 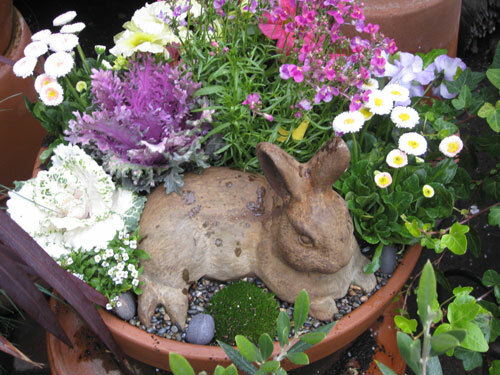 Just add the bunny and make this simple planting combination, special! Use statuary and garden decor in your containers to add personality or to create a mini-themed garden. 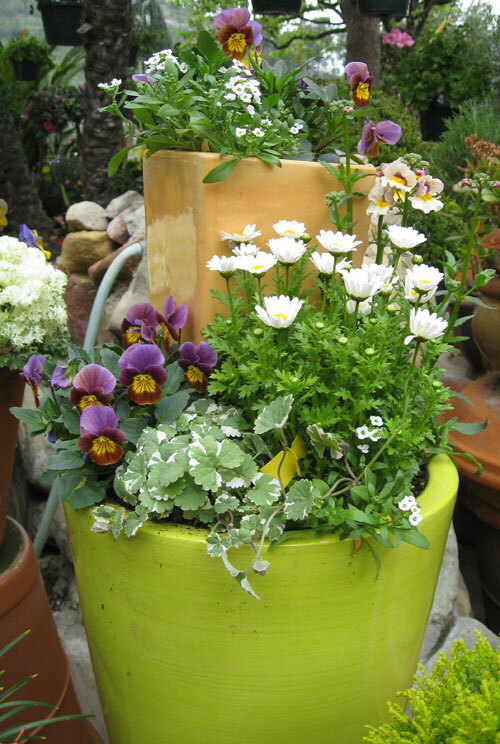 Use colored recycled glass as a mulch for your container plants for year-round color. Anything that can hold up to water without rotting or leaching toxic chemicals into your container can be used as a decorative figurine. Don’t be afraid to experiment and add your personal style to your garden! This blog post is part the Garden Designer’s RoundTable group blog event today. Please visit these other talented designers for more inspiration! 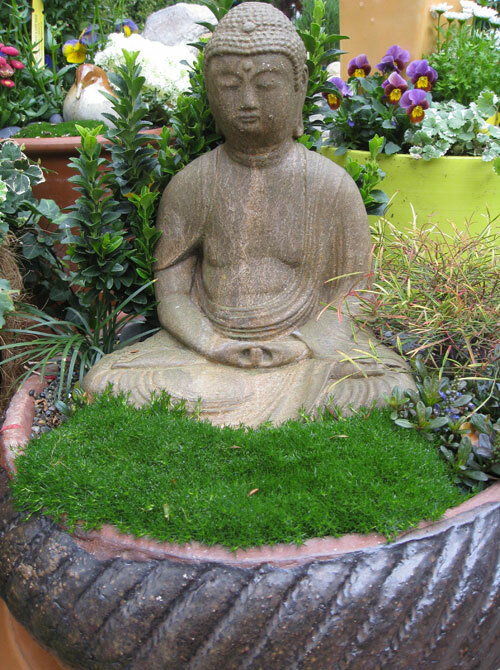 I want to create my own meditation garden like the one on the picture in the post with Buddha and fake grass. Not sure where to buy it tho. Get so many ideas from this blog cant wait until the summer is here so I can fix my backyard. Lovely containers… Look at the landscape, they are also so lovely! I can’t choose for the best, they are all beautiful!! 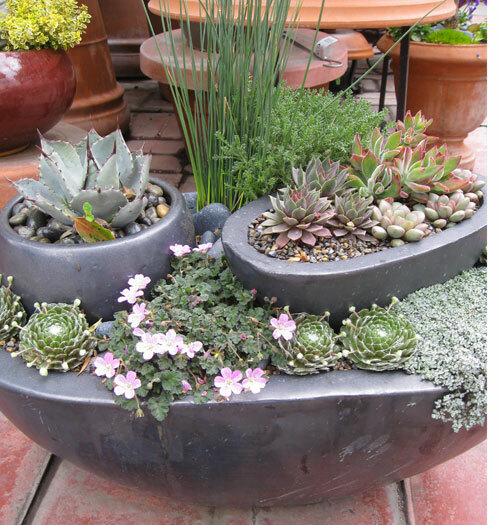 Love, love, LOVE the succulent container gardens! I absolutely love some of these ideas for pots, some of which could very easily be also used for <a href="http://www.gardeningfocus.com/bonsai-containers/">bonsai containers</a> as well as on your patio or balcony. Thanks again for a really informative blog entry, Mary. I love the buddah and your use of unusual items that make such wonderful additions to container gardens. Your use of color and texture is amazing! Very cool. Thanks for the great ideas, your vision and artistic eye are incredible! I love container gardening in general. The dress form was a stellar idea. Beautiful! I love the bunny rabbit. What a neat idea. Thanks Scott. I appreciate the visit, especially from you who are so busy! Hi Shirley! What great mini gardens you have created here. Great ideas to add containers to containers, it adds so much interest. A wonderful “mini” tutorial! Great post. How nice to see you here! Thanks for your compliment. Thanks so much. I like my bromeliad as well. It is colorful year round and perks up the living room. 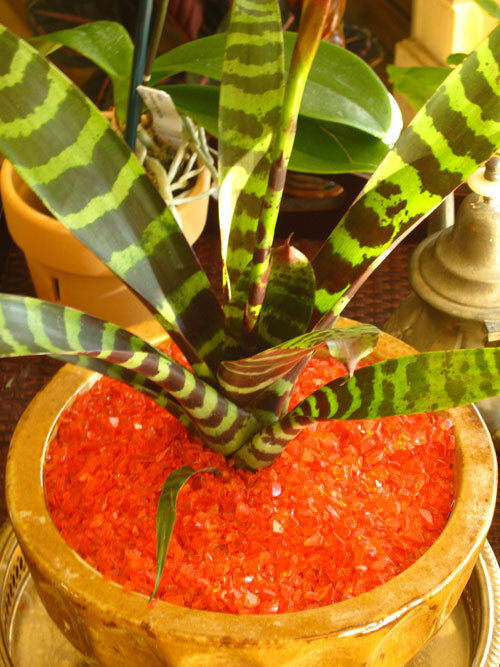 I am IN LOVE with the tumbled glass/bromeliad container!!! If only I could keep anything other than succulents alive in containers, I’d copy you! Great post Shirley! OF COURSE!!! HI Shirley! I LOVE your addition of non-plant material in your container plantings. I’ve been starting to experiment with that as well–you really have an eye for that! My pleasure Jocelyn. Thanks for visiting. Glad you liked the blog post. See you over at your blog! Thanks for the compliment and for taking the time to create such a comprehensive and inspiring blog post on container gardens. Great job. Great seeing you here at EdenMakers. Thanks for visiting and commenting! Thanks Sweet Rebecca for visiting and commenting. I enjoyed your blog post as well. I am safer using my muffin pan in the garden, if you know what I mean! Thanks for your compliment. I guess you can say “out of the box” is my mantra in life. Please visit Eden Makers again. Yes, I do love color Debra. Thanks for visiting me at Eden Makers and commenting. Hope to see you again soon! Love the zinc containers (I have several, myself)! But I never thought about stacking them like that – genius!! Leave it to YOU to think of something so clever…. I adore that zinc planter trio, Shirley. I may have to copy that look one day! Of course all of Shirley’s container photos would be SO stylin, like the fashionista that she is! I love them, they are SO uniquely YOU, Shirley. You really inspired me to try the container in container idea again, haven’t done it in a while. SO cute! I love your creativity and use of color. The muffin tin garden and the metal figurine are simply fantastic. Thanks for the inspiration! I second that, what a great idea to combine containers (great use for those matching smaller ones that might get lost on their own). I love putting the sculptures in too, the Buddha is especially nice. Thanks, Shirley! Hi, Shirley — Great photos and ideas. 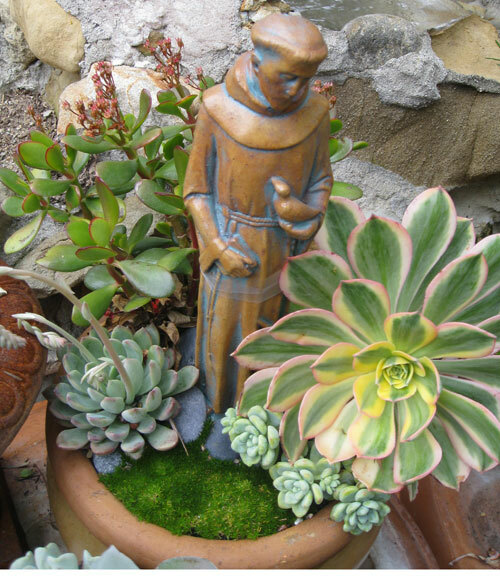 I love the way you add personality to your pots with topdressings and figurines that are appealing but not excessively cute or kitschy. The stacked pots are intriguing, too. But best of all? Color! You love it, like I do. Real outside the box thinking and some great colour combos there! 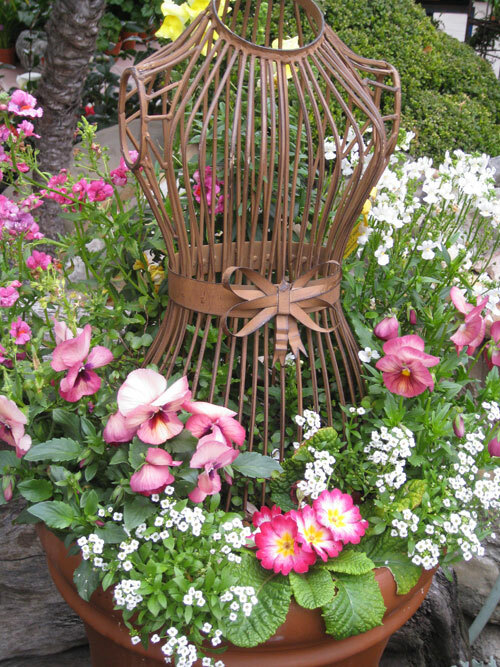 Love your sculptural approach to container garden design, especially the “pot within a pot” look! Thanks for the fresh ideas, Shirley.